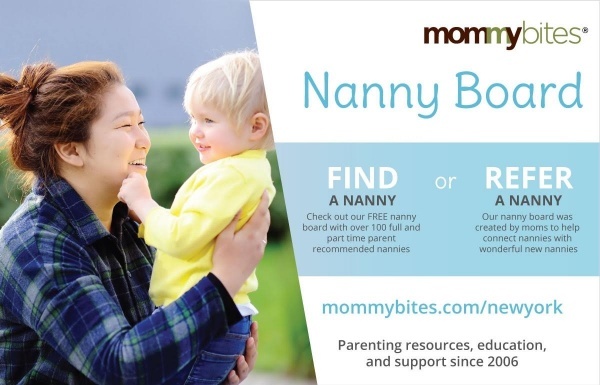 The Mommybites FREE nanny board is the ‘go to’ place for finding high quality nannies since 2006. Mommybites has connected thousands of families with hard working nannies over the years and their unique posting system requires that nannies can ONLY be listed by a former employer. The families who post on the Mommybites board feel so strongly about finding their beloved nanny a loving new home they take the time to write about their nanny, pay a posting fee and also include their own contact information for an automatic reference! Mommybites is the go-to parenting community for resources, support, and education for expectant moms, new moms, and moms with young children. Mommybites offers expert parenting advice and online classes on parenting topics. In the NY area, Mommybites hosts boutique mommy-and-me holiday events. Since 2006, its Nanny Board has been connecting families with mom-recommended NYC nannies. Moms can look for flexible work or help with projects on the Jobs Board. Families can find fun events on the Events Board. Mommybites also holds raffles and posts casting calls for kids and families.